My all-time fav dessert is HERE. 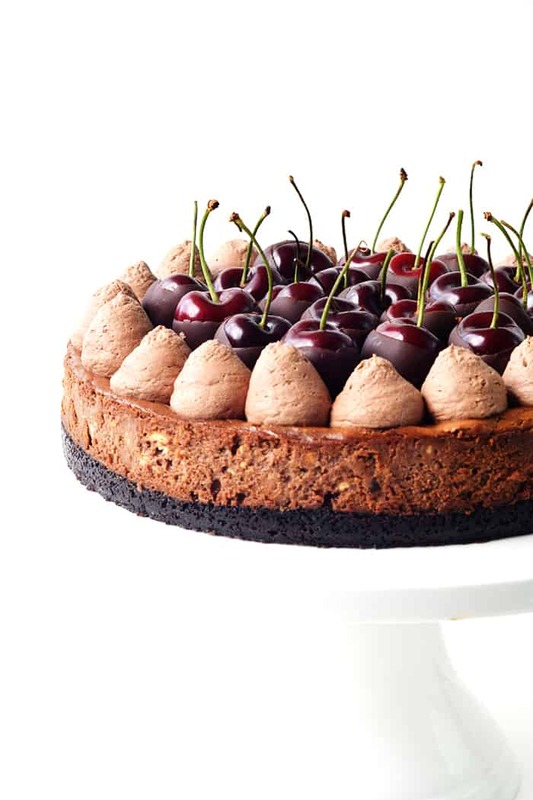 Baked Black Forest Chocolate Cheesecake with an Oreo crust, chocolate-dipped cherries and clouds of chocolate cream. Can you EVEN? I’m in cheesecake heaven! 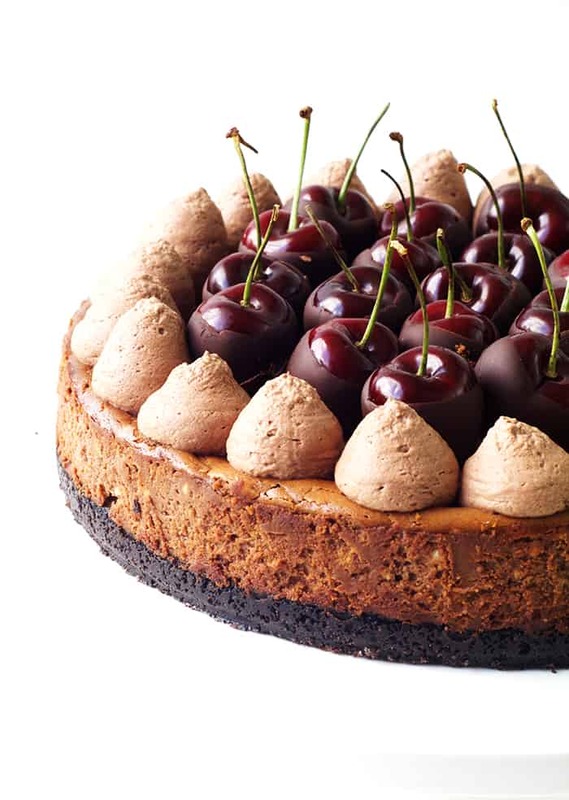 It wasn’t long ago that I shared my recipe for my favourite Baked Sour Cream Cheesecake but today is ALL about chocolate. A baked chocolate cheesecake made with real chocolate, that is E-A-S-Y friends! Well, the countdown is ON and Christmas is less than one week away (what?!). So I know so many of you must be on the hunt for the perfect Christmas dessert. And here it is. 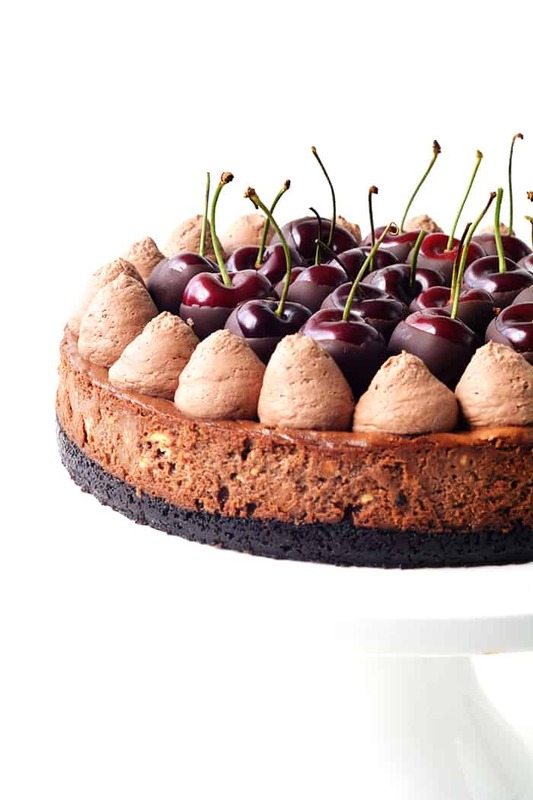 A Baked Black Forest Cheesecake that is gorgeous to look at and even more lovely to eat. 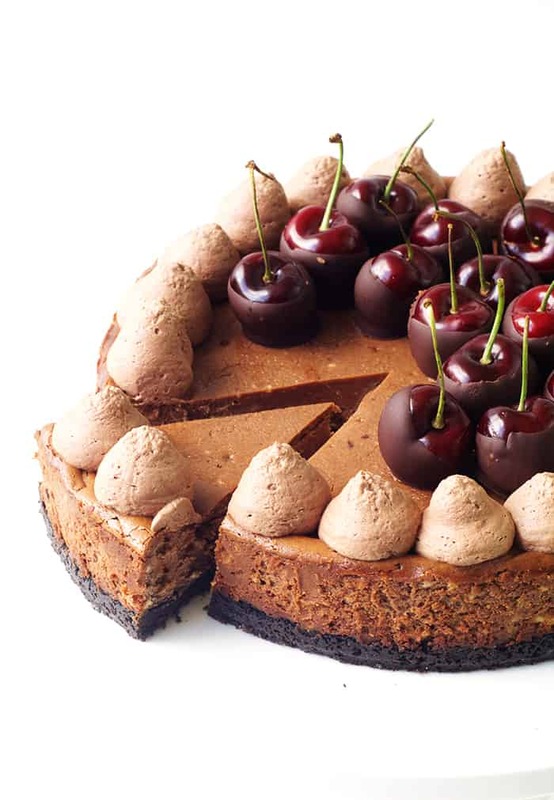 This creamy chocolate cheesecake is baked in the oven – but there is no need for a water bath. Hooray! 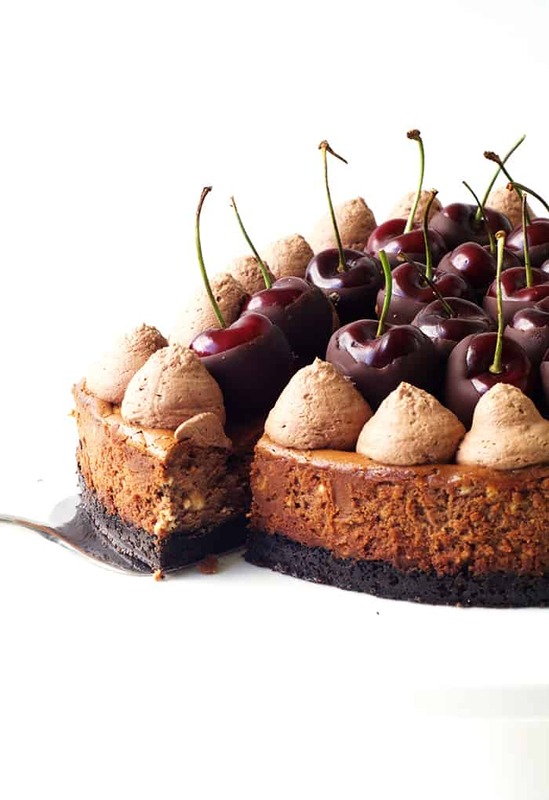 Once your cheesecake is baked to perfection, it’s time to decorate with chocolate-dipped cherries (my latest obsession) and plenty of chocolate whipped cream. Even when you have eaten the house down for Christmas lunch or dinner, you will have room for a piece of this cheesecake #trust me. I actually photographed this cheesecake early one morning and after I did the ‘slice’ shot I had a bite. It was even more delicious than I was expecting so I ended up eating the whole piece. #cheesecakeforbreakfastanyone? But I can’t complain. This time of year is all about enjoying the good things in life. 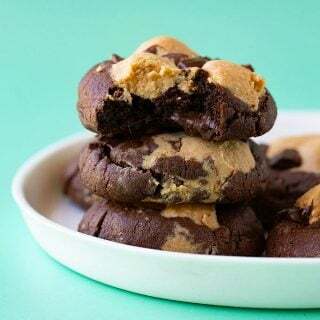 Who knows that calories don’t count on the holidays? I still have some of this cheesecake left in my fridge and I’m totally tempted to dive in and have another piece right NOW. How are you spending Christmas and the holidays? I’m so looking forward to being with family and having a little time off work. It’s been a big year. But a great one. And I’ll be back on Thursday for one more treat before the big day. I have FINALLY finished my Christmas shopping and am so relieved. Tomorrow we are having a Christmas lunch at work and playing a round of Bad Santa. Have you ever played? It’s the game where you can steal other people’s presents – it always ends up the same way. Half the room is happy and the other half mildly annoyed. I’ll let you which one was me! But if you want an delicious, festive and stunning dessert, look no further. 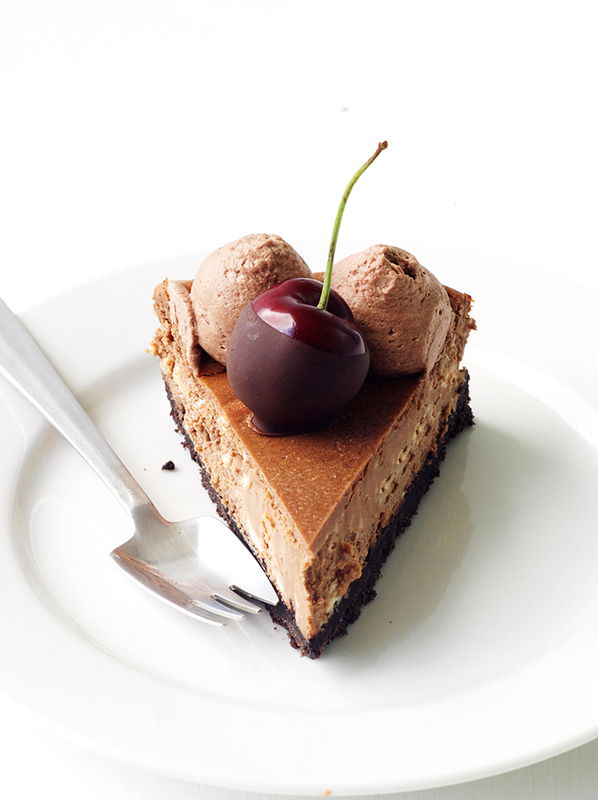 You can make this chocolate cheesecake a day or two in advance and keep it in the fridge. Then you only have to decorate it on the day. I am all about making Christmas Day e-a-s-y but still delicious. 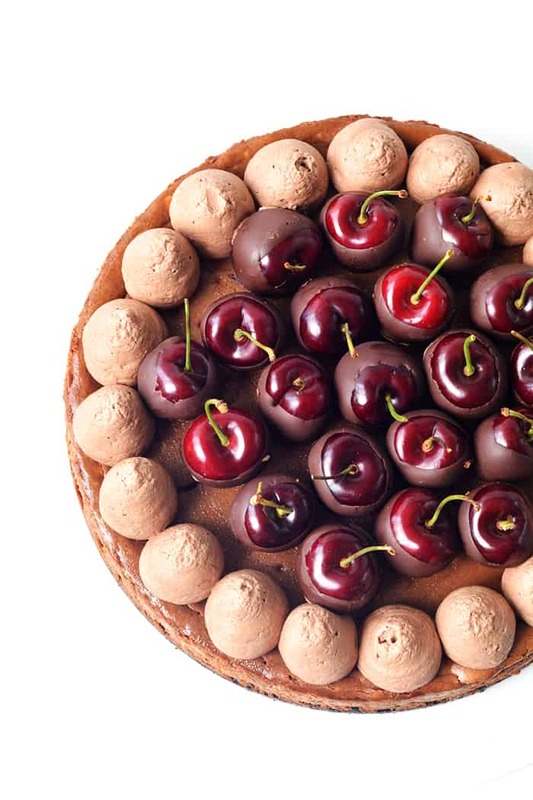 You could even dip those cherries in chocolate ahead of time too. My advice though? Buy a few extra because chocolate-dipped cherries are addictive! I’m sharing the recipe for this Black Forest Cheesecake over on Handle the Heat today, so pop on over and check it out! Visit Handle the Heat for the FULL recipe. Hi there, I'm Jess. My life changed forever when my travels to the USA opened my eyes to wonderful things like smores milkshakes, red velvet cake and New York cheesecake. Now I love to spend my days creating American-inspired desserts. Read More. I hope you have an incredible Christmas, gorgeous! Oh god that chocolate cream, it looks MAGICAL!!! Also– cheesecake for breakfast? The answer is always yes. haha oh gosh I have definitely played that game with the presents and you are so right as to how it always ends up! Anyway! This cheesecake is stunning!! Merry merry christmas!! 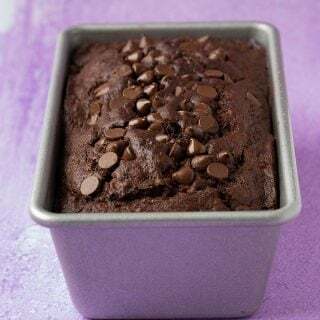 I can see how this would be your favorite dessert! I don’t think I’ve ever seen a prettier cheesecake. 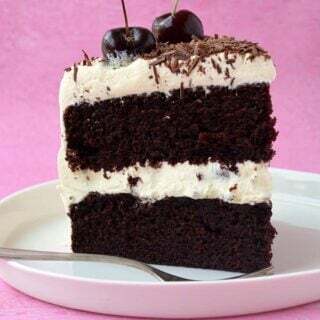 And that Black Forest flavor is divine! And those cherries!! Simply gorgeous. My life changed forever when my travels to the USA opened my eyes to wonderful things like smores, banana pudding and red velvet cake. Read More.